Hi Vis Softshell Jackets from hivis.co.uk are a great alternative to fleece jackets and allow you to retain a stylish look whilst remaining compliant with ENISO20471 standards. As well as making sure you are clearly seen by all on site, be it day or night, our Hi Vis Softshell Jackets can also be custom embroidered with your company name, logo or branding. This can be applied on both the front and back of the jacket. The softshell Hi Vis clothing we provide is available in a variety of colours such as yellow, orange and navy, while we also stock two tone designs. Each design is complete with a reflective banding to ensure you are well seen and identifiable. 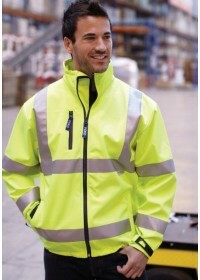 Sizes for Hi Vis Softshell Jackets range from extra small (XS) to four times extra-large (4XL). Our selection of high visibility softshell jackets not only keep you warm and dry, they are also highly functional with a number of zipped pockets which are perfect for storing items you need to hand as you work. To contact our team to discuss Hi Vis Softshell Jackets or any other product for that matter, do not hesitate to give our helpful team a call on 01744 814004. You can also reach out to us via email at hello@hivis.co.uk.